Water is clearing and temperatures dropping with winter getting closer here in East Central Florida on the Indian River and Mosquito Lagoon. The last few weeks has been fun fishing both in the backcountry for a variety of species and on the flats hunting Redfish and Seatrout, water is still high but slowly coming down as no rain has fallen for a month and cold fronts starting to come through with north and west winds which will continue to drop water water levels. Backcountry fish have been liking the clear water in the Intracoastal Waterway area with all the different fish eating shrimp, mullet, and soft plastic artificials, Seatrout, Redfish, Snook, Mangrove Snapper, Jack Crevalle, Ladyfish and more different species have come aboard my boat. 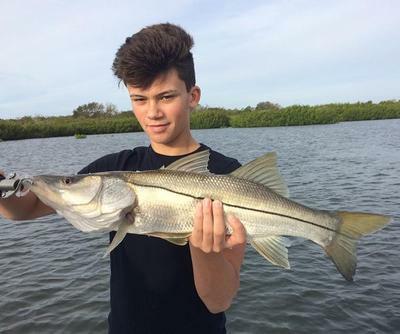 Paul from Michigan came along on a fun mixed bag backcountry trip catching all the different fish along the way with son Danny catching the big fish of the trip a fine Snook�������. 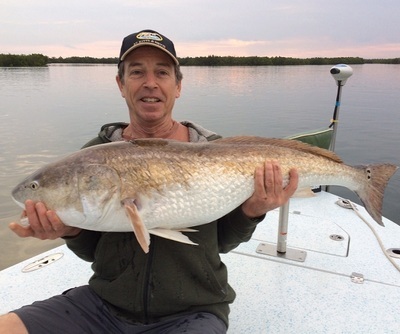 First time client Carl here on vacation from Pennsylvannia did a solo backcountry trip last week having a great time, the tone was set with the first fish of the morning being the biggest, a jumbo 45" Redfish which ate a live ladyfish bait and gave an epic battle on light tackle������. Being the off season for charters this time of year even I got a chance to get out and scout and fish on Mosquito Lagoon, throwing soft plastics, jerk baits on the flats, on jig heads on the drop offs, Seatrout were pretty cooperative������..